New softwood treated Railway Sleepers. We are frequently asked for railway sleepers for use as retaining walls or as a decorative feature in the garden. 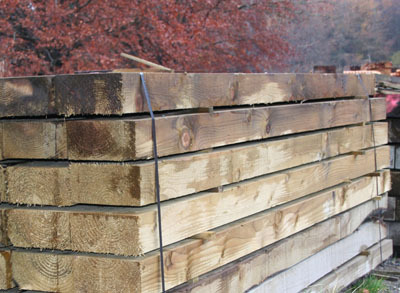 We can cut and supply a number of different sizes of railway sleepers. We stock First Grade ( No edges missing ) and mixed grade sleepers( may have some edges missing and some cracks) - please phone to check availability of the size you require and if you have any queries. Here is one example of a customers garden, showing what can be done with the use of railway sleepers.